Starting with the Dark Below DLC, Bungie have changed the method for purchasing Legendary gear such as weapons and armour. Rather than needing just Marks, players sometimes need a special currency called a Vanguard Commendation or Crucible Commendation to buy the new gear. Just like Glimmer and Marks, when you purchase the weapon or armour piece, the Commendation will be spent, thus requiring you to earn another one for your next piece of gear. Commendations allow both low and high level players to easily reach Level 30 (and Level 31) without any requirement to play either of the Raids. As with other rank rewards, the Postmaster dishes out the Commendation reward for a rank increase. How to get a Vanguard Commendation? 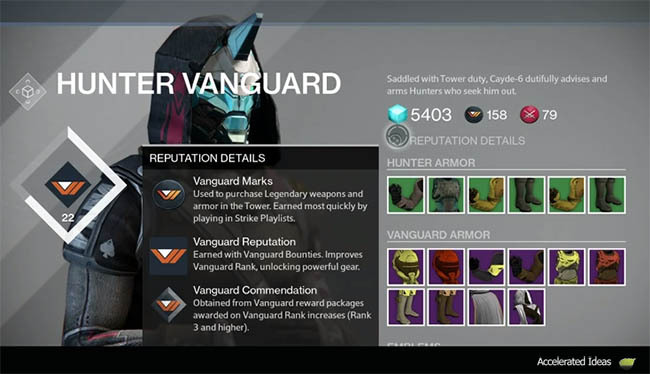 Visiting a Vanguard Vendor at the Tower will immediately reveal your current Vanguard rank, shown on the left of the vendor screen. Increasing your reputation, through strikes and bounties, will push you over the threshold for a rank increase and a reward from the Postmaster. 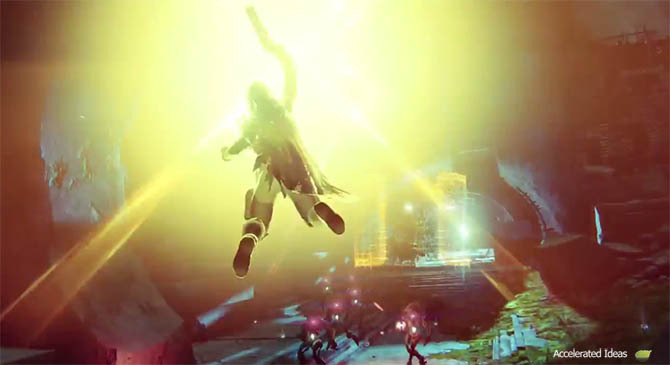 Players wishing for a Vanguard Commendation must achieve a rank increase to level 3 or above. Anyone currently on Vanguard Rank 2 will receive a Commendation the next time they rank up. Anyone above level 3 will continue to receive Commendations for every rank increase thereafter. The same principle applies to a Crucible Commendation. You'll just need a Crucible rank increase instead. Together with the new Commendations, Tower Vendors now sell high level Legendary armour and weapons. This armour will help you reach level 30 and possibly level 31 if you max upgrade and possibly combine with an exotic. There is no need for Raid gear from either the Vault of Glass or Crota's End to hit level 31, although you can happily mix and match armour as you wish. The important point to note about the new Legendary gear is the light stat. Some people confuse Light Stats with Light Levels, thinking that a Light Stat of 30 means they can only get to Level 30 with that armour piece. The actual use for Light Stats is a tally, which when added together across all armour pieces, gives you a total Light Score. That number itself determines your Light level. Therefore, when buying new armour from the Tower Vendor, check the maximum Light stat and make sure it surpasses 30 if you want to reach Level 31. If the stat only shows a maximum value of 27 then this is the old Legendary gear which will only get you to Level 29. The new higher level armour should have a maximum Light Stat of 33. Total would be 135, which would take you to Level 31 easily!! You could even skip the last upgrade path of one of your armour pieces and still hit 133. Similar to the DLC Legendary armour, the new Legendary weapons have higher base stats which provide clues to their strength. The old Legendary weapons, i.e. the ones before DLC, had a base stat of 248 before any upgrades. 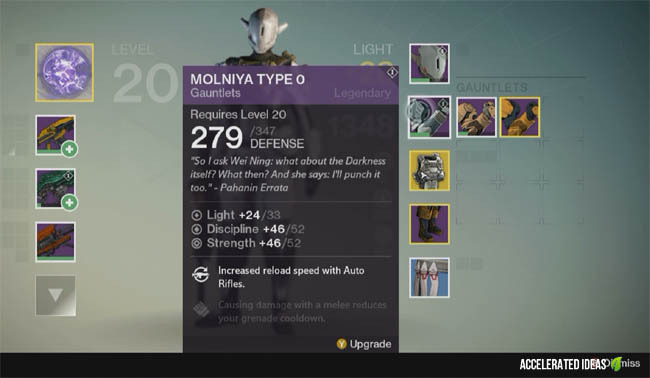 The new Legendaries will have a base stat of 272 rather than 248 in this DLC. So whether you buy one of these or win one through an engram, look at the base stat to determine if this is a new or pre-DLC version. Fully upgrading one of the DLC Legendary weapons will take it past the 300 mark and up to Attack 331.